You have probably noticed by now that negotiating official authorizations in Ethiopia can be complicated. For us, this week was filled with more than the normal amount of bureaucratic angst. So much so that by Thursday it was looking like certain things we wanted to do were simply not going to happen. One of those things was a safari in South Africa’s Kruger Park later this month. The snag had to do with immunizations. After booking the trip, I learned that travelers entering South Africa from Ethiopia must have a WHO yellow fever certification. 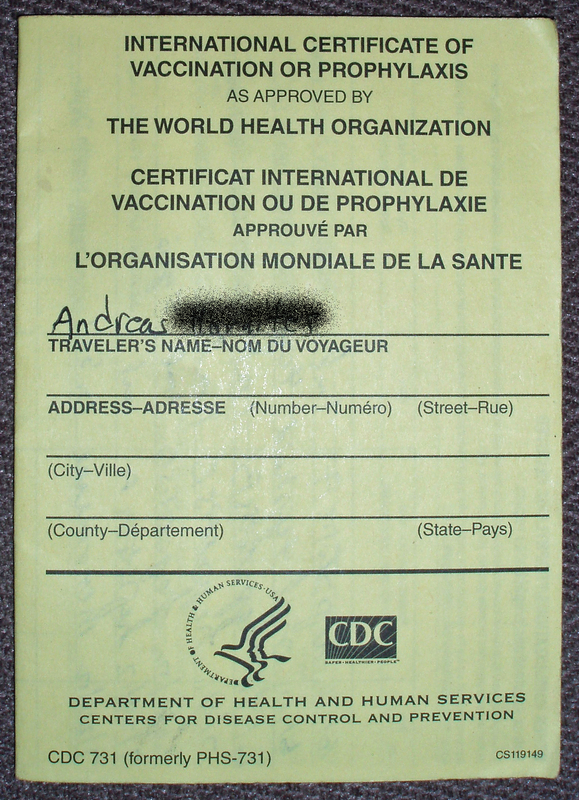 This is a yellow immunization card that you can buy when you get your yellow fever vaccination. Alekka and I didn’t have cards. All three of us got yellow fever shots when we were in Medford this summer, but only Andreas paid the extra dollar for the card. I don’t remember whether the county health worker didn’t mention the card to me or if I didn’t think we needed it (I had the printed vaccination record), but either way both Alekka and I arrived in Ethiopia without them. What Alekka and I didn’t get. The authorities in South Africa accept only the official cards as proof. I immediately feared the worst. What kind of hoops would we have to jump through to get these cards, and could it be done within two weeks? The nurse at school suggested I call the Swedish Clinic, the city’s major faranji health care provider. The nurse there told me that the only place in town that can issue the WHO card is the Black Lion Hospital, the big public hospital in downtown Addis. That bad feeling I had suddenly got worse. I asked a couple of colleagues if they had ever been to the Black Lion and got some seriously concerned looks in response. Two of them suggested that the black market was a better option than the Black Lion. Apparently there are men hanging around outside the hospital who offer fake yellow cards for a price. Huh. I thought I’d rather try the legitimate route first. In addition to a health office signature and stamp, the card requires the vaccine manufacturer’s name and the batch number. That information was not on the immunization record I had from county health. I called my daughter Alice in Medford. Alice called county health and got them in a good mood right after lunch. To my (and Alice’s) great surprise, they bought her story about parents in Africa and readily provided her with the manufacturer’s name and the batch number. Armed with this information, I cajoled Andreas into accompanying me to the Black Lion. In addition to our passports, the immunization receipt, and the notes from my Skype session with Alice, I also brought plenty of cash along just in case we had to resort to plan B.
Fortunately, the whole thing went off without a hitch. We took a taxi to the hospital complex, where we asked for directions to the immunization section. We walked right in; no waiting in line. The woman at the desk understood my problem (with a shake of her head for the health department that doesn’t automatically issue yellow cards). She copied our names off our passports into her ledger, sent us to the cashier next door to pay 84 birr ($1.75 each), checked off the receipt, and we were done in ten minutes. As we were leaving with our new yellow cards, the clerk asked me, “How much does yellow fever vaccine cost at your home?” The price was on the vaccination record sheet I had with me: we’d paid $101.00 each. She laughed and shook her head again. Here, the $1.75 price covers not just the card, but the shot as well. 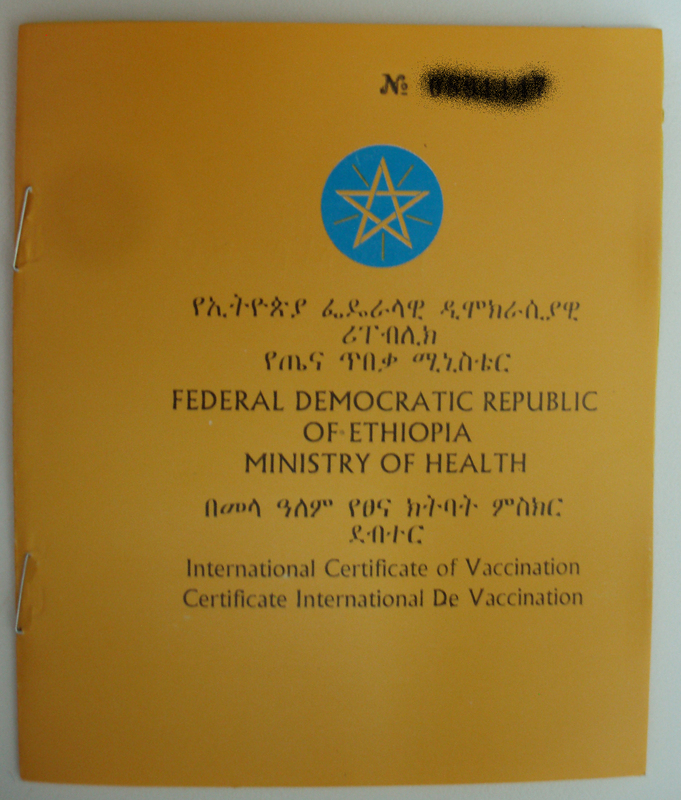 This entry was posted in Addis Ababa, Ethiopia and tagged immunization card, safari in south africa, yellow fever vaccination. Bookmark the permalink. I bumbled into your blog through Becky K’s Goodreads account (I just joined). This is Kathy Fritts, the librarian who first answered your questions about going overseas. When I heard you got Damascus, I was thrilled but then worried about your future; I was wondering how the heck Syria turned out. But it sounds like you are doing JUST FINE! I’m glad to hear you are happy and successful and I will eagerly follow your adventures. On another matter, I have a drama teacher friend looking for a one-year stint (her school will only give her a one-year sabbatical). If you hear of any such openings, let me know, eh? Kathy, how wonderful to hear from you – you are the one who started all this for us! We are indeed doing just fine. I’ll let you know if I hear of any drama openings. Hey! thanks for the quick response and I’m so glad to hear that I had a hand in your adventuring. I am fascinated; your blog brings it all back. Of course in 1988, no blogs – no nothing. Just those little blue aerogram envelopes and bank by mail. The good old days. Take care, and I will just live vicariously.